Kindly note that the days and times given below are in PST (Pacific Daylight Savings Time). For Rocky Mountain Time (except AZ which is on PDT in the summer) add 1 hour. For Central Time, add 2 hours. For Eastern Time, add 3 hours. For Alaskan Time, subtract 1 hour. For Hawaii-Aleutian Time, subtract 2 hours. For Greenwich, add 8 hours. For Central European time (CET) add 9 hours, for Eastern European Time (EET), add 10 hours. RUNE OF THE MONTH: Hagalaz “challenges”. Bumps in the road both test our resolve and keep us on our toes. Without them, our journey would become stale and probably even downright boring. Projection into the unknown helps us unearth the skills and talents we may not even have known we had, which in turn promote inner growth. Jupiter remains retrograde this whole month until August 11. Its shadow period extends until November 6th. The degrees covered in May (23º41’ to 20º45’ Sagittarius) are represented in the Sabian Symbols by: “A bluebird perched on the gate of a cottage”, “A group of immigrants as they fulfill the requirements of entrance into a new country”, “A Chinese laundry”, “A child and a dog wearing borrowed eyeglasses”. We are being asked to examine our level of ethics, tolerance and compassion. What is our attitude towards foreigners and people who are different from us, in general? What do we believe in? Do we walk our talk? Are we as transparent as we would like to think we are? Are we free from what others think, or do we fake it so that we might be seen as belonging? How true to ourselves are we? Saturn remains retrograde this whole month until September 18 between 20º31’ and 19º45’ Capricorn. Its shadow period lasts until December 24. The images associated with these degrees are: “A relay race”, “A hidden choir is singing during a religious service”. We are being challenged in our mastery, our self-sufficiency and our discipline in becoming all that we are in our divinity. As we help ourselves, the heavens help us. Initially, we only have ourselves to rely on. The journey towards enlightenment is paved with good intentions, but only do our commitment and unrelenting efforts bring us to inner and outer completion. Pluto remains retrograde this whole month until October 3. Its shadow period continues until January 24, 2020. The degrees traveled in May (23º08’ – 22º50’ Capricorn) are symbolized by: “A woman entering a convent” and “A soldier receiving two awards for bravery in combat”. Passion and commitment are one and the same. No matter what path we choose, it is by embracing it wholeheartedly that we shall reap the laurels of recognition and find inner fulfillment. Until Wednesday 5/1 at 3:23 AM: when the Moon enters Aries. On Friday 5/3 between 1:47 AM and 1:18 PM: when the Moon enters Taurus. On Sunday 5/5 between 8:10 AM and 8:40 PM: when the Moon enters Gemini. From Tuesday 5/7 at 4:50 PM till Wednesday 5/8 at 2:06 AM: when the Moon enters Cancer. From Thursday 5/9 at 7:06 PM till Friday 5/10 at 6:14 AM: when the Moon enters Leo. 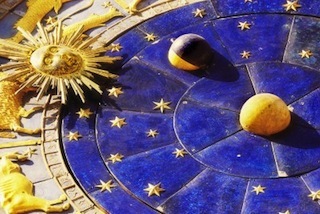 On Tuesday 5/14 between 10:19 Am and 11:51 AM: when the Moon enters Libra. On Thursday 5/16 between 2:37 AM and 2:26 PM: when the Moon enters Scorpio. On Saturday 5/18 between 2:11 PM and 6:21 PM: when the Moon enters Sagittarius. From Monday 5/20 at 10:05 AM till Tuesday 5/21 at 0:56 AM: when the Moon enters Capricorn. From Wednesday 5/22 at 6:57 PM till Thursday 5/23 at 10:49 AM: when the Moon enters Aquarius. On Saturday 5/25 between 5:51 AM and 11:08 PM: when the Moon enters Pisces. From Monday 5/27 at 9:21 PM till Tuesday 5/28 at 11:32 AM: when the Moon enters Aries. On Thursday 5/30 between 8:08 AM and 9:43 PM: when the Moon enters Taurus. Moon in Aries between Wednesday 5/1 at 3:24 AM and Friday 5/3 at 1:17 PM + between Tuesday 5/28 at 11:32 AM and Thursday 5/30 at 9:42 PM: Perfect for intense physical activities, anything requiring forceful, direct action and self-assertion. Good also for leadership, spontaneity, good will, being a way shower, initiating new projects or bringing our car to the mechanic…. Moon in Gemini between Sunday 5/5 at 8:40 PM and Wednesday 5/8 at 2:05 AM: Excellent for multi-tasking, curiosity, any form of communication, exchanging information, sending e-mails, calling friends and acquaintances. Great also for social activities, attending conferences, reading a book, watching a documentary, gathering data on various topics, connecting with new people…. Moon in Cancer between Wednesday 5/8 at 2:06 AM and Friday 5/10 at 6:13 AM: Perfect for family activities, especially those involving children. Good for spending more time at home, cooking, nurturing ourselves and those we love, inviting the people we cherish over for dinner. Excellent also for drawing, creative writing, humor and anything requiring imagination and a touch of craziness…. Moon in Virgo between Sunday 5/12 at 9:22 AM and Tuesday 5/14 at 11:50 AM: Excellent for starting a new fitness program, learning, healthy nutrition, fasting, clearing our closets, cleaning our home, reorganizing our drawers…. Perfect also for detailed work, the focused use of our intelligence, and taking care of small pets…. Moon in Libra between Tuesday 5/14 at 11:51 AM and Thursday 5/16 at 2:25 PM: Great for relationships, associations, diplomatic exchanges with others, anything related to beauty (a haircut, buying new clothes, a make-over…), art (especially painting and decorating…), a pleasant social event (concert, art exhibition…). Moon in Scorpio between Thursday 5/16 at 2:26 PM and Saturday 5/18 at 6:20 PM: Perfect for scientific research, esoteric studies, self-transformation, shamanism, dealing with the mysteries of life, death, and sexuality, as well as insurances and issues involving personal power. Moon in Sagittarius between Saturday 5/18 at 6:21 PM and Tuesday 5/21 at 0:55 AM: Perfect for traveling, religious and/or philosophical activities or matters related to higher education and the law. Excellent for lecturing, learning, perfecting a foreign language, exploring other cultures… Perfect also for athletic training and tending to large animals (horses….). Moon in Aquarius between Thursday 5/23 at 10:49 AM and Saturday 5/25 at 11:07 PM: Perfect for philanthropic activities, charitable organizations, meeting with friends, making new acquaintances. Good also for inventions, far out, progressive ideas, inter-dimensional and time travel, anything related to UFOs, computers and technology in general…. This month’s intentional meditation started on Friday 4/19, when we took out as many blank sheets of paper as we would have intentions and placed them near a window, on a balcony or in a garden so that they would bask in the light of the Full Moon in Libra. Once that moment had passed, we gathered our Full Moon charged blank sheets and placed them in a folder. Next month’s intentional meditation, begins on Saturday 5/18. Take out as many blank sheets of papers as you will have. intentions and place them near a window, on a balcony, or in a garden so that they bask in the light of the Full Moon in Scorpio at exactly 2:11 PM. Once that moment has passed, gather your Full Moon charged blank sheets and place them in a folder. We could feel laden with responsibilities, somewhat discouraged and having to deal with tasks requiring great seriousness of purpose. Best to keep quiet, tackle the work that needs to be done with focus and discipline. Communications could lead to dead-ends. We are likely to come up against strong personalities. Forcing issues is not helpful. Best to lay low, keep our opinions to ourselves and focus on unity. Later tonight, we have to be careful not to give in to the opposite and promise more than we can deliver. Our exuberance and positive energy open new doors. Not a good day to gamble, nor go on a shopping spree as we could end up foolishly spending more money than what we are buying is worth. Great for a dynamic adventure. Our vital energy is at an all times high. Excellent also for defending our ideas with courage and panache. During the next 3 weeks, our thinking is practical. We tend to stay with our thoughts and ideas for a while before making an enlightened decision. We could be drawn to nature and inspired to protect Mother Earth. Social encounters could feel more like work than fun. Our relationships could be strained and somewhat disappointing when not downright depressing. We could feel lonelier than usual. Best to rely on ourselves, plan a project with attention to its details and focus on insuring our security. A day to expect the unexpected. Changes in plans disrupt our schedule. Unusual social encounters open new doors. Exciting ideas free us from the known. We could feel particularly inspired. Artists could come up with some of their best work. Channelers and healers are likely to experience major breakthroughs in their perceptions. Our social life is particularly enriching and adventurous today. We feel generous, warm hearted, tolerant and positive. We could be invited to some elegant event that enables us to dress up and mingle with interesting people, some of whom are connected to other countries. We should however be careful not to give in to jealousy, envy or possessiveness. Emotional insecurities could surface either in ourselves or others, revealing where blocks to intimacy lie. Using common sense in our financial transactions is a must today as we could be drawn into spending more than we have or fall prey to a scheme that is not as honest as it looks. A day to get noticed by those in positions of power. We stand in our mastery, are reliable, efficient, grounded and focused. Our excellent organization helps us move closer to our ambitions and makes a good impression on people in positions of power. Our inner knowingness helps us see through lies and illusions. A day to stand in our power and mastery to make real changes both in ourselves and our environment. A day of balance of the masculine and the feminine within us. Our romantic relationships are peaceful and harmonious. Social contacts are pleasant and uplifting. Moderate efforts create positive financial rewards. During the next two months, Cancer natives are favored. Our actions aim towards ensuring our safety and security, as well as protecting those we cherish. During the next month, our sensuality is enhanced. We seek comfort, beauty and peace. We are attracted to nature and the simple pleasures of the body. Nurturing ourselves brings a great sense of contentment and well-being. Today, more specifically, is particularly inspiring for artists, healers and channelers who are able to access higher dimensions and perceive, as well as share, the magic of life. A good day for clearing our desk of backlogged work. Our thoughts and communications are serious and grounded. Our discipline and focus are aimed at furthering our ambitions. We are particularly efficient today. We are able to X-ray situations and people. Our insights into existing conditions are strong and clear. We could become the spokesperson of a silent majority. Our words make a lasting impression on those we meet. People trust what we say, sensing that it doesn’t come from some book we read, but from the depths of our experience and knowingness. Our social life becomes interesting. We could encounter unusual, highly individualistic characters enticing us to create more freedom in our lives. We could get caught in a whirlwind romance that is fun even if only short lived. Money comes to us unexpectedly, ushering new opportunities. During the next month our curiosity is enhanced. We seek communication, are attracted to learning, traveling and stimulating new acquaintances. Today, more specifically, is very good for attending a social event, mingling with new people, studying, reading and exchanging interesting ideas. We could feel bored with the usual routine. Bursts of physical energy make us want to mix up our usual routine, try something new and/or start an exciting new venture. Creative solutions are found to the challenges at hand. We should however exercise caution when driving or operating sharp objects. Not a good day to sign legal documents as we could miss the fine print. We could feel a little confused, vaguely anxious and quite dreamy. Misunderstandings might occur easily. A situation could seem very different from what it really is. Someone could be less than honest with us, revealing only half of the truth. Spiritual imagination could take the place of common sense. Excellent really only for artistic creativity. But otherwise, laying low may be a good choice today, as we could also feel quite drained. Our senses are particularly elevated today, allowing us to see the beauty in all things and connect in oneness to the divinity in all beings. Artists are particularly inspired. A relationship begun today connects us to another at a soul level. We should however beware of promising more than we can deliver and falling for schemes too good to be true. We don’t court illusions today and approach our relationships with much realism. We are likely to walk away from a romantic involvement that has been shaky for already some time, while a good one becomes more solid. Sound financial decisions mark this day. We favor saving rather than spending and are focused on ensuring our monetary safety. Wishing you a magical month of May!